ST. CLAIR — Smart Shelf, a Michigan‐based company started by brothers Dan and Ed Cass, announced that its patented portable furniture platform has been licensed with the Walt Disney Co. 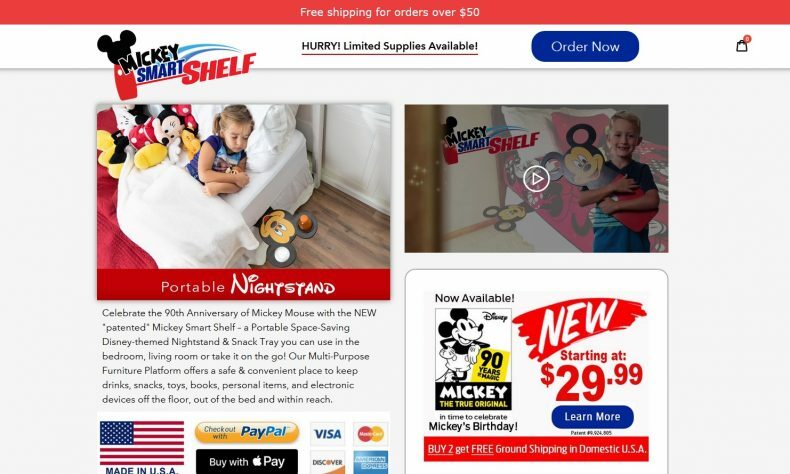 The Mickey Smart Shelf designs were expanded to fit into the new Disney Home Store product line and the launch of the 90th Anniversary of Mickey Mouse. The Mickey Smart Shelf is a Disney‐themed portable furniture platform that functions as a nightstand and snack tray. The tray slides under a mattress, and keeps personal items within reach, off the bed, and off the floor. It can also be configured with beverage holders, reading lights and flashlights. Future versions will include wireless device charging, according to the Cass brothers. The product idea is the brain‐child of local entrepreneur brothers Dan and Ed Cass, who have won several pitch contests with it. To learn more about Smart Shelf and its other products, contact Ed Cass at (810) 637‐1333 or email smartshelf@mail.com. More at www.DisneySmartShelf.com.